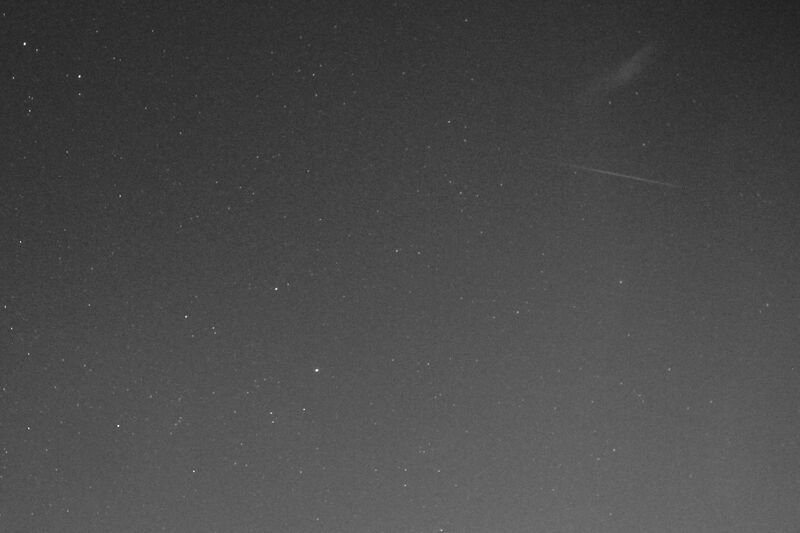 The 2014 Geminids were the best meteor shower I’ve seen in years. I live in a suburban area with light pollution, so I knew not to expect the maximum number of meteors per hour predicted by the press. When I went out Friday night (the night before the shower peak) to practice meteor photography, I saw 5 meteors in 37.5 minutes. That’s better than I’ve seen during the peak of some other showers. When I went out Saturday night (the shower peak), I saw 35 meteors over 3 hours. That’s pretty good given that the clouds were coming and going and I spent some time inside processing pictures whenever the clouds got discouraging. Two of the meteors I saw were pretty spectacular. Both had a greenish color to them, and one widened and brightened as it crossed the sky. Unfortunately, the camera was turned the wrong way, so I only captured the start of the first one. Because meteors are so fleeting, I needed to capture as much light as possible. So I started with the smallest f-stop to set the lens wide open. Then I wanted to have as long of an exposure as possible so that I would catch an entire meteor trail and not spend too much time on the overhead of triggering the next shot. I started with 30 second shots, but the ISO I had to use to not wash out the pictures was pretty low, and although I should have seen meteors in some of the shots, I didn’t. So I switched to 15 seconds with a higher ISO. I managed to capture some of the meteors that I saw, but not others. 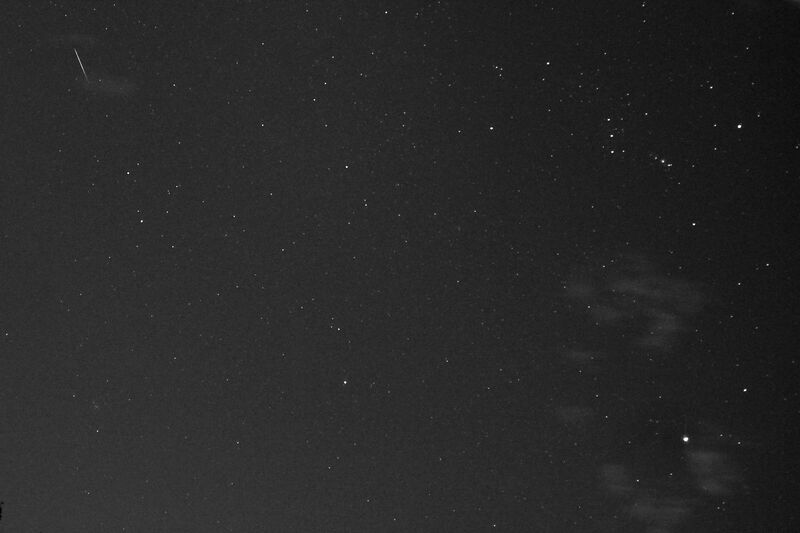 I think when I try it again I may go to 10 seconds and an even higher ISO. Unfortunately, it looks like it’s going to be cloudy tonight, so I may have to wait until the next shower to try it out. I just got home from Apollocon 2013, which I consider my “local” science fiction convention. I’ve been going for a number of years, and I always enjoy it. As usual, I wished I could borrow Hermione’s time turner so I could attend multiple panels at the same time. I enjoyed all the typical con things: meeting other authors, expanding my thinking on various issues at the panels, and coming home with new books and a list of more books and blogs that I want to read. Of course, I am fascinated by meteorites, so I enjoyed all these talks immensely. But even if one is not fascinated by meteorites, these guys make their subjects compelling. I highly recommend going to one of their talks if you ever get the opportunity. Yesterday, as my family was driving down the freeway, I saw a bright light in the sky. Initially, I thought it was a helicopter with its lights on, but it was moving too fast and disappeared midair. Since watching meteor showers and trying to “catch” a meteor with my camera is a hobby of mine, I suspected I had seen a stray fireball, so I took note of the time and our location (and wished we had a dashcam that would have caught the event). When I got home, I checked the American Meteor Society web site, and someone else in the area had reported seeing a fireball at the same time! So I contributed to science and added my observation. I also checked my favorite satellite visibility web site, and the time and trajectory did not match up with any visible satellites or Iridium flares (and I think it was moving too fast to be either). That event is now AMS event 1149 with three observers to date. Did anyone else in the Houston area see it? Do you have any stories of other fireballs you have seen? The most amazing one I’ve ever see was over Florida almost 20 years ago. Amazingly bright and I was convinced that one landed somewhere. Unfortunately, I didn’t know how to capture or report that data at the time, but I’ve always wondered what happened to it.